A new E2E (Equipped to Equip) generation graduated this Monday and we are so grateful for the things that God does in our students’ lives and to see the growth in their characters. This program was developed in order to help them to see if they are called to be missionaries and to experience the mission field and a missionary context. The main thing we want for them is to follow God’s calling wherever that leads them to go. In this second generation we had 7 students and during the past 6 months we learned, we laughed and we prayed together to find what God wants for their lives. They had the chance to study ten modules like: preaching, evangelism, discipleship, missionary agency, fundraising, partnership, leadership, missionary profile, church planting and the missionary project. Each one of these modules and our teachers poured into the students’ lives knowledge, support and love for the mission field. We pray that other people can have the opportunity to be blessed in the same way like these 7 young people were and for that we need your support in prayer and financially. At the end of the program, our desire is that every person who is called to be a missionary to be able to proclaim from the bottom of their hearts the lyrics: “I will love You with my yes and with my obedience, Jesus”. Thank you for all your support and for your investment in the students’ life and in God’s Kingdom. Sharing the gospel can be a scary thing. Being vulnerable to people about your faith and what you believe in is something many of us shy away from. Putting yourself out there with the possibility of being rejected is something we all fear. Well, in the southern region of Romania there are only around 0.2% born-again believers. Many pastors and missionaries have coined the phrase “the graveyard” to describe the spiritual climate in this part of Romania. So, the odds are statistically just NOT in your favor if you desire to make it out of Romania without experiencing rejection when it comes to sharing your faith. If rejection is inevitable, then who would willingly decide to go to Romania with the goal of sharing the gospel? Well, this past week a team of 16 high-schoolers from Arizona decided that it was worth the risk of being rejected for the sake of the cross. That although the odds may not have been in their favor, the potential of making just one person experience the love of Christ was worth it. In a span of only NINE days, these 16 teenagers set out to make a positive impact in the lives of the people in Craiova and Draganesti-Olt. 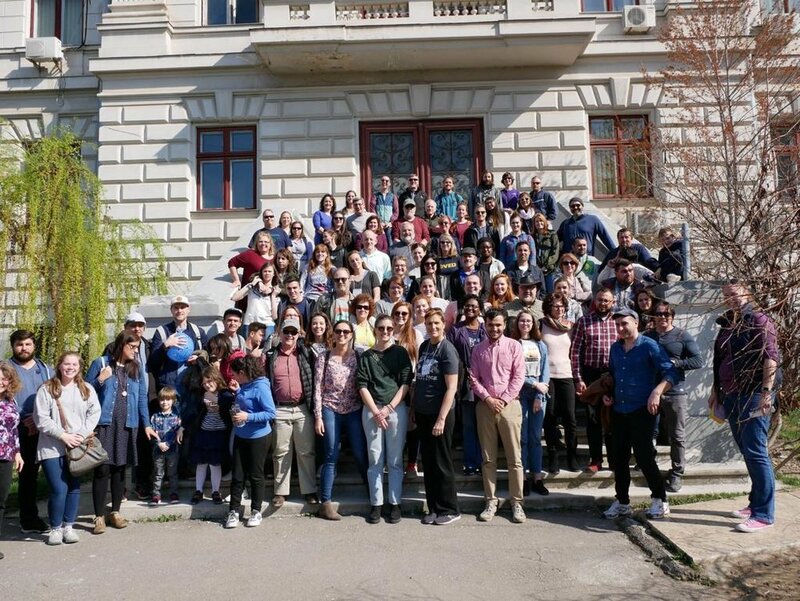 They did this by coming alongside our Hope Church staff and missionaries to help carry out and participate in various programs and events to make connections with the people of Romania. The Arizona team hosted a 3-on-3 basketball tournament that brought out many teenagers and young adults from the community. 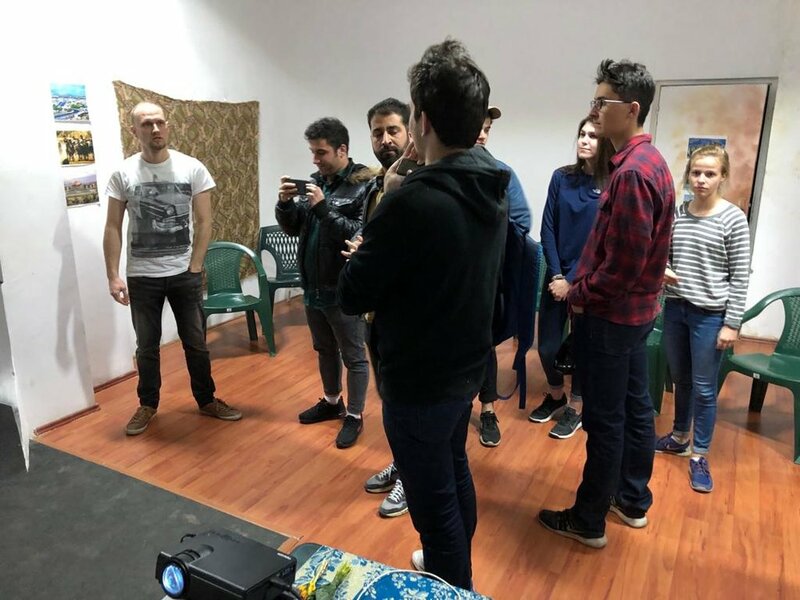 Not only did this tournament allow engagement with the people of Craiova, but it also united young World Racers and men from a nearby naval base, all of whom are fellow Americans oversea. 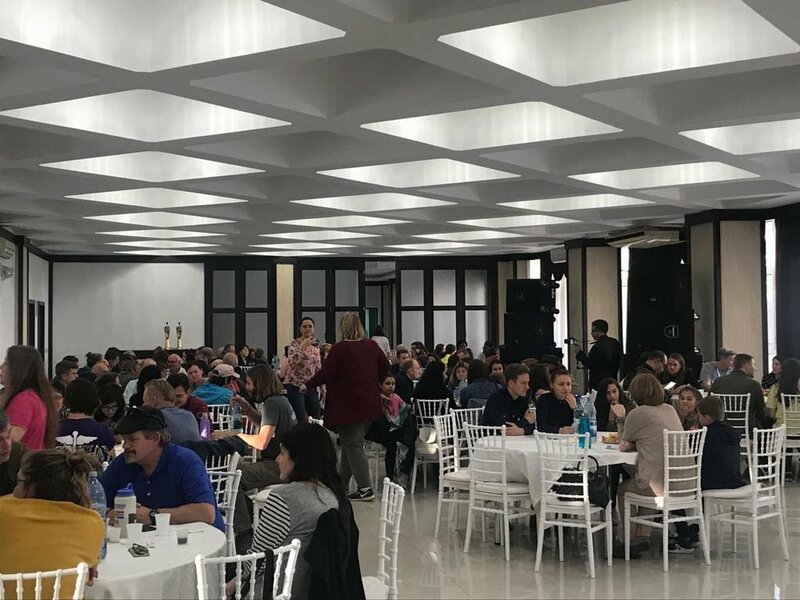 This tournament was important in that it helped build trust and relationships between the younger generation of Craiova and both American missionaries and Hope Church. This group of teenagers also passed out New Testaments to the homes in Draganesit-Olt. Because of their efforts, approximately 5,000 people now have access to a New Testament Bible! They did home-visits and gave out food bags. On Sundays, the team split up so they could go to multiple churches, including 3 Roma churches, to see and encourage the people. They even went into the prison and had a program for the prisoners where the students shared their testimonies and led worship! These are only some of the many things the Arizona Team did during their NINE day stay in Romania. Hope Church and our missionaries cannot begin to express how thankful we are to have been able to have partnered with such an incredible group of young believers who are on fire for the Lord! Our heart’s desire is to have MORE teams, whether young or old, who have a fire in their heart, to brave “The Graveyard” and come to Romania to join alongside us in our work to bring Kingdom to Romania! And if you can’t physically come, then consider partnering with us financially or in prayer. The mission field is an area where is a constant need for partners to join our purpose to spread the Gospel. Through God’s grace, we are blessed to have every year teams that have a huge impact in our region. Among this kind of partners we have the World Race project. This “race around the world” represents an 11 months trip in 11 countries, where the racers want to be the hands and feet of Jesus. Romania is on their itinerary many times so we have the opportunity to work with them many months every year. 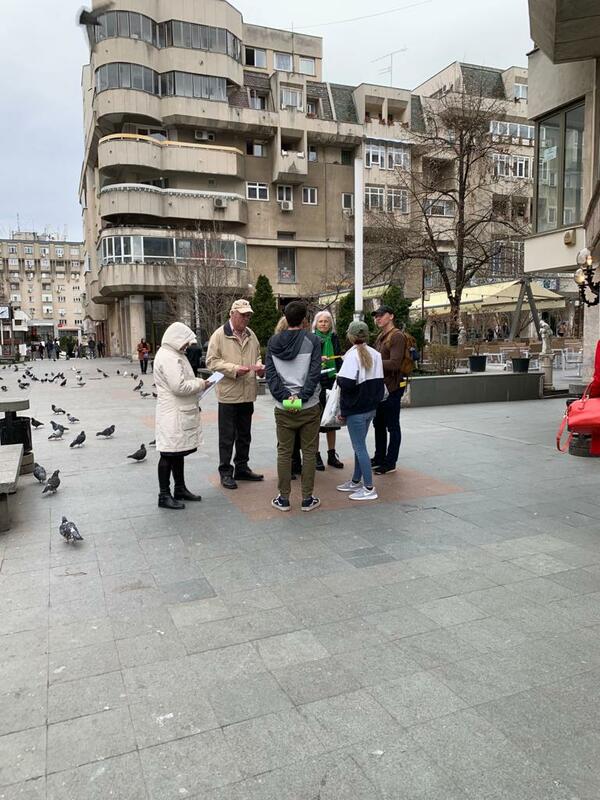 Our most recent collaboration was in March when we joined our forces to bless the people from Craiova, Draganesti-Olt, Bals si Alexandria with New Testaments, prayer, practical work and lots of love. At the end of the month, we had 3 days of PTV (Parent Vision Trip) events. During the PVT, the racers reunited with their parents so they can experience the mission field and to join their children in their ministries. For 3 days we had the honor to work with them in different projects to make God known and to create bridges between missionaries and non-believers. Our first day of ministry was in Craiova where we united to remake the Joshua prayer around the University of Craiova. 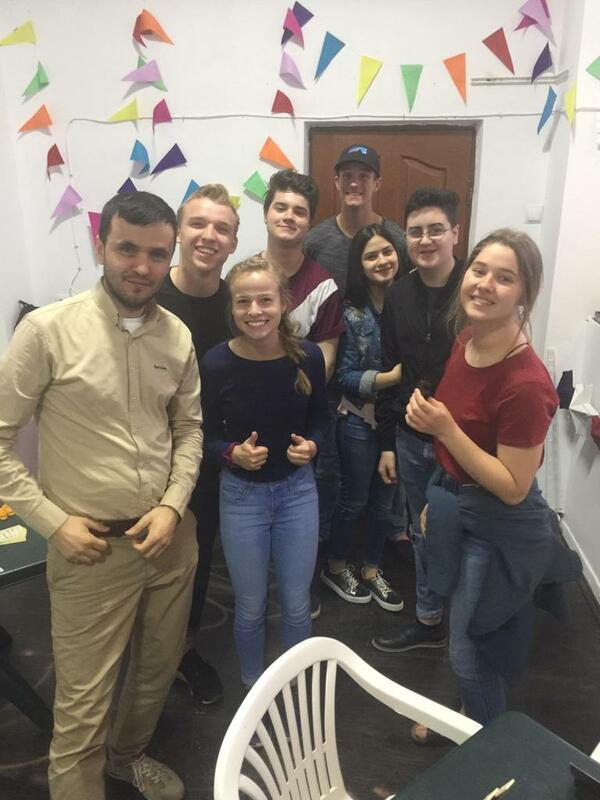 We prayed for the students and for the people in Craiova to find Jesus and to receive Him in their lives. In the evening we had a social event during which we had the opportunity to meet new people, talk to them and build relationships. We were able to see the results of your prayers because many people came, much more than we expected, and we had to add a few more tables. We also witnessed the power of God when we heard the testimony of o parent who was a drug addict until he met Jesus and quit his addition from that moment. Sunday, we split in smaller groups and we went to different churches to encourage the people through testimonies, songs and through our presence. That evening, we spent time together at a restaurant where the missionaries shared their testimonies and ministries to build partnerships with our guests from America. Our final day was in Alexandria, a new county we invest in. There we had three projects: Joshua prayer, New Testaments project and Eyeglasses ministry, an event where we offer prayer and eyeglasses for free. We can already see God’s work in this county and we believe that He’s going to do great things there. Thank you for your support and I want to invite you to join us in prayer for the missionaries, their projects and for the teams that are willing to come to serve with us because we want to see God’s name be glorified in Oltenia.